Turkey has escalated its offensive against Kurdish fighters in northern Syria, pounding them with air strikes and artillery, and complicating the battle against the Islamic State (IS) group by Ankara and Washington, both Nato allies. In the fight for Aleppo, meanwhile, the Syrian military used a lull in violence to urge residents and rebels to evacuate the besieged opposition-held part of the city. Turkey's state-run Anadolu news agency said as many as 200 members of the Kurdish-led forces were killed in Syria's Aleppo province by the Turkish bombing and shelling. A senior commander with the main Syria Kurdish militia confirmed the Turkish attack on his forces north of Aleppo but disputed the casualty toll, saying that no more than 10 fighters were killed. Like in Iraq, where Kurdish fighters are at the forefront of the offensive to retake the city of Mosul from IS, Kurdish forces in Syria also have been battling the militants and made significant territorial gains in Aleppo province. That has dismayed Turkey, which is dealing with a home-grown Kurdish insurgency and trying to prevent an expansion of Kurdish influence in Syria. "We will not back down," said senior Kurdish commander Mahmoud Barkhadan of the People's Protection Units. "We are fighting Daesh. Why are they striking at us?" he asked, using the Arabic acronym for IS. Mr Barkhadan accused Turkey of aiding IS militants by turning the fight into a Turkish-Kurdish battle. Turkish artillery also hit near Afrin, a Kurdish enclave in north-western Syria, he said, adding that his forces have not retreated but that Turkey's actions allowed IS fighters to wage a counter-offensive. More than 10 fighters were killed and 20 wounded in over 30 aerial attacks that began on Wednesday night, he said. The Britain-based Syrian Observatory for Human Rights said at least 14 Kurdish fighters were killed and four were missing. Anadolu, quoting military officials, reported the raids were carried out late on Wednesday night on 18 targets in the Maarraat Umm Hawsh region in northern Syria. Between 160 and 200 militia fighters were killed, it said. The targets struck areas that Syrian Kurdish forces recently took over as they pressed a campaign to drive IS militants from areas north of Aleppo. The Syrian Kurdish forces have been a source of tension between Turkey and the United States. The US considers the militia group - the People's Protection Units, known as the YPG - to be the most effective force against IS in Syria. Turkey calls it an extension of its own outlawed Kurdish militants who have carried out deadly attacks in Turkey and considers it a terrorist organisation. Anadolu said the 18 Syrian Kurdish targets hit included nine buildings used as headquarters, meetings points, shelters or arms depots, along with five vehicles. The pause in the fighting in Aleppo is part of a humanitarian ceasefire announced by Russia in the contested city to allow for the evacuation of civilians and fighters, as well as the wounded. Rebels have rejected the offer to evacuate, saying it was not serious. 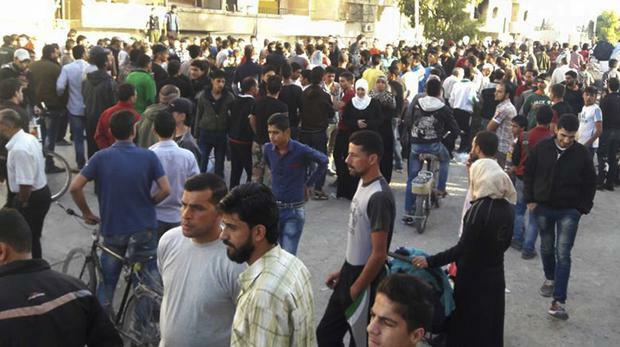 Clashes were heard at one of the safe corridors announced by the Syrian military. "Talk of fighters or non-fighters leaving is denied and groundless," said Ammar Sakkar, spokesman for Fastaqim, one of the largest rebel groups operating in Aleppo. "The rebels' decision has not and will not change. It is to be steadfast." Eastern Aleppo, besieged by government troops, has been subjected to intense and relentless airstrikes by Syrian and Russian aircraft in recent weeks. Hundreds of people have been killed and whole neighborhoods destroyed. "Our dear people in Aleppo districts, let the wounded and sick leave... We guarantee you safe passage. Seize the opportunity and protect your families' lives," government loudspeakers echoed from a checkpoint. They offered a warm meal and medical help along the way. "There is no point in continuing to fight. Your positions and bases and warehouses are known to us precisely. Don't use civilians as human shields," the announcements said. But there were no takers on Thursday, with residents saying they did not trust the promise in the absence of international monitors. UN Syria envoy Staffan de Mistura insisted a unilateral ceasefire aims only to allow medical evacuations and is not part of a broader plan that he has laid out for Aleppo, countering an assertion by Syrian President Bashar Assad that most civilians want to leave. Later UN Secretary-General Ban Ki-moon says nearly 500 people have been killed and almost 2,000 wounded since the Syrian government launched its offensive on the eastern, rebel-held part of the city of Aleppo on September 23. Mr Ban says the city's besieged district has seen "the most sustained and intensive aerial bombardment" since the conflict began five and a half years ago. He told the UN general assembly that the unilateral pause in bombing announced by Russia that began on Thursday is welcome and will hopefully lead to urgent medical evacuations. But the UN chief said "this is the bare minimum," and what is needed is full humanitarian access to eastern Aleppo and a nationwide cessation of hostilities. By Jamie Harris, Press Association Science Technology Reporter Cloud services and subscription-based products such as Prime helped Amazon achieve strong quarterly results once again, with net sales up 17% to 59.7 billion dollars (£42.6 billion). By Alistair Mason, Press Association A bear caught the attention of visitors to a safari park when she pulled out a makeshift flannel and washed her face with it.